all over the world visit the many quail hunting plantations in Worth County, several of which are open to the public. Many of these grand facilities offer deer hunting, dove hunting, fishing, luxurious accommodations and excellent meals to compliment the quail hunting adventure. Many of the residents and visitors of Worth County enjoy leisure time on and around Lake Blackshear. It offers 8,700 aquatic acres for swimming, fishing, boating, water skiing, camping, and picnicking. An energized downtown retail district in the County Seat of Sylvester has locals shopping at home. Revitalization efforts, renovations, and an attractive streetscape design have allowed downtown to become a magnet for both local consumer dollars and tourist spending. The cost of living in Worth County is low at 76.7, which is based on a national average of 100. 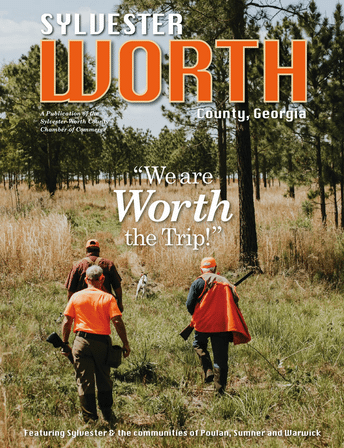 As a member of the Georgia Recreation and Parks Association, the Sylvester-Worth County Recreation Department is a family-friendly organization dedicated to enhancing the recreational opportunities of Worth County residents. The SWCRD offers baseball, softball, t-ball, football, soccer, cheerleading, and basketball. Facilities include multiple ball fields and a gymnasium. For adults, the Recreation Department sponsors an adult church coed softball league and aerobics classes. We also have a Splash Park, five community parks for recreation and relaxation as well as a Community Village Garden where you can pick your own produce. Amenities include picnic pavilions, playgrounds, an amphitheater, a walking/jogging track, and basketball and tennis courts. In addition, the Mary Shipp Senior Center offers activities for Senior Citizens five days a week. Worth County is centrally located so you are only a short drive from Multi-Cultural Arts in Atlanta, the grandeur of the north Georgia mountains, the beauty of the Atlantic coast, or the Gulf of Mexico. The Worth County School System is comprised of four excellent learning institutions including Worth County Primary School, Worth County Elementary School, Worth County Middle School, and Worth County High School. Success begins here! The Worth County School System instills a foundation and desire to learn and succeed into our young people. In addition, our active, involved parents and community leaders are a major ingredient for success in the Worth County School System. Worth County Primary was named a Georgia Title 1 Distinguished School. WCP is proud to have won Georgia School Bell Awards from the Georgia Association of Elementary School Principals for its “Wee Deliver” in-school postal program, as well as its comprehensive Outdoor Classroom program. The WCP Outdoor Classroom also received one of eight National Sea World/Busch Gardens/Fuji Film Environmental Excellence Awards. Worth County Elementary School has been a Title 1 Distinguished School for 5 years and has also received numerous honors in recent years. Two governors have honored Sylvester Elementary for its participation in Red Ribbon Week. The school has also received a Certificate of Participation from Computers for Education for supporting computer education at school. Four teachers have achieved Model Classroom Status from the Reading Renaissance Program for outstanding usage of the Accelerated Reading/Reading Renaissance program. In addition, SES has received the Georgia School Bell Award for its Accelerated Math and Accelerated Reader Program. Worth County Middle School became a Title 1 Distinguished School. WCMS actively seeks parental involvement. The faculty and staff provide quality education by involving parents, students, and teachers in cooperative planning. When students and parents help set and implement educational goals, achievement is high! Technology is a big part of leaning at WCMS. The latest technology is utilized in almost every aspect of the teaching process. It is at Worth County Middle School where students first begin to achieve athletic success. A large spectrum of athletics programs is available at the middle school level. Worth County High School is where students prepare for their future. WCHS offers college preparatory and a career/technology curriculum. Honor classes are available in each academic area. The WCHS Technology/Career Education Program prepares students for industry certification in Business Education, Health Care Sciences, Transportation, and Horticulture. WCHS has post-Secondary Option Agreements with several colleges in the area including Abraham Baldwin College, Albany State University, and Southern Regional Technical College. A distance learning lab provides on-site college courses to WCHS students. Student athletes at Worth County High School excel in many sports. As a member of the Georgia High School Association Region, athletes compete against the best of the best. Athletic teams include football, baseball, softball, competition cheerleading, cross country, basketball, golf, track, wrestling, soccer, and tennis. The Worth County School System has many things to be proud of. The gifted program in Worth County is showing steady growth according to the state report card. Faculty in the gifted program use a variety of delivery models in their instruction including pullout, advanced content, and resource. Each has own nurse, Each Title 1 Distinction, SACS district, each AYP. Graduates in Worth County have a variety of options when it comes to post-secondary education. All of these institutions are within a comfortable commuting distance to Worth County. Albany State University – Albany, GA (20 miles). Albany State University is a growing regional institution that offers undergraduate and graduate liberal arts and professional degree programs. Valdosta State University – Valdosta, GA (70 miles). Offering undergraduate and graduate degrees, VSU is located on a Spanish Mission style campus nationally recognized for its beauty. VSU offers a diverse and comprehensive curriculum in the humanities, education, nursing, sciences, business, and the arts. Georgia Southwestern State University – Americus, GA (60 miles). Bachelor degrees are available from five schools – Arts and Sciences, Business Administration, Computer and Information Sciences, Education, and Nursing. Graduate programs are available in Education, Science, and Administration. Abraham Baldwin Agricultural College (ABAC) – Tifton, GA (20 miles). Choose from baccalaureate and associate degrees Divisions include Ag and Forest Resources, Business, Humanities, Social Science, Nursing, Science and Mathematics, and Physical Education. One-year certificate programs are also available in Agriculture and Forestry, Business Administration, and Nursing. Southern Regional Technical College – Moultrie, GA (27 miles). With a Worth County campus located in Sumner and in Sylvester, Southern Regional offers diplomas, Associate Degrees in Applied Technology, and Technical Certificates of Credit. Albany Technical College – Albany, GA (20 miles). Albany Technical College offers associate, diploma, and certificate programs in a variety of disciplines including technical sciences, agriculture, business and computer technology, construction, public services, and health. Business leaders appreciate Georgia’s renowned Quick Start Program. Implemented through our states’ technical colleges, Quick Start is designed to provide customized training for your business. Both Albany Tech and Southern Regional are official providers of the Quick Start program. Very few communities the size of Sylvester have such easy access to such excellent health care services. Sylvester is one of the few rural communities to have a thriving hospital. Phoebe Worth Medical Center became a member of the Phoebe Putney Memorial Hospital family in 2002. Their partnership with this large regional hospital located in Albany, allows Phoebe Worth Medical Center to offer many services unheard of in small communities. The emergency center is one of the biggest assets of Phoebe Worth, providing 24-hour a day, 7-day a week immediate care. In addition, Phoebe Worth offers general medicine and acute care, oncology unit, obstetrics, a swing bed unit for rehabilitation, physical therapy, and occupational therapy. Phoebe’s Wellness programs serve local employers with screenings, pre-employment physicals, and on-going health education. The Worth County Health Department is often one of the first places visited by new families, because they are a leading provider of school immunizations. This facility offers a variety of health care services and is utilized by Worth County residents from all walks of life and is certainly an asset to the community.